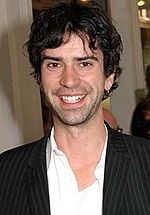 Hamish Linklater is an American actor best known for his starring role as Matthew in the television sitcom The New Adventures of Old Christine, from 2006-2010. He also has a starring role as Andrew Keanelly, an art director, in the television sitcom The Crazy Ones. Hamish made his screen debut in the 2000 feature film Groove (2000) which he followed up with Final Draft (2003) and Fantastic Four (2005). His television credits include the movies 5ive Days to Midnight (2004) and Live from Baghdad (2002). He also had a recurring role on American Dreams and was a series regular on Gideon's Crossing. Linklater spent his summer 2006 hiatus in New York starring in theatre productions of Cyclone at Michael Imperioli's Studio Dante and opposite Jill Clayburgh in The Busy World is Hushed at Playwrights Horizons. His additional theatre credits include Singing Forest and Recent Tragic Events. He appeared in the premiere of Richard Greenberg's Violet Hour and was in the New York and Los Angeles premieres of Good Thing at the New Group and Center Theatre Group, respectively. Linklater's other New York theatre credits include Hamlet, Love's Fire, Romeo and Juliet, The Square, Chemistry of Change, Measure for Measure and A Midsummer Night's Dream. Linklater was born in Great Barrington, Massachusetts. He is the son of reknowned acting vocal couch Kristin Linklater and is married to playwright Jessica Goldberg. Click HERE for all April teasers. Click HERE for ALL teasers! You browser doesn't have Flash, Silverlight, Gears, BrowserPlus or HTML5 support.